I must admit shamanism has long fascinated me, although I was originally put off studying it by the person who trained me in Wicca, many years ago. They told me, rather scathingly, that the only real shamans had belonged to the Sami people from Scandinavia and there weren't any of them left any more. Although that may be true in a historical sense, there are plenty of modern practitioners using ancient shamanic techniques for healing and they seem to be very effective. I've done a little shamanic journeying in the past, under expert guidance, but always wanted to read a plain and simple, easy to understand book that explained exactly what a shaman does and how they do it. 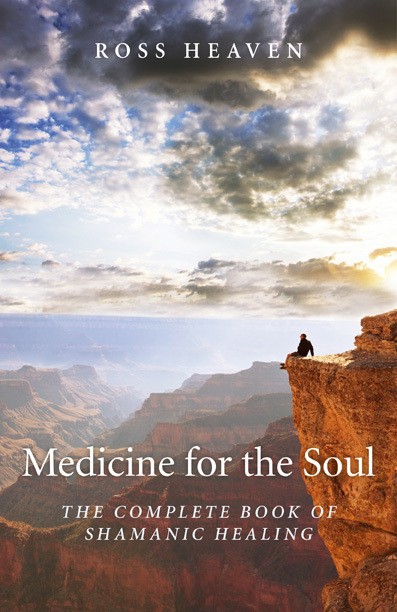 So, I was delighted when I got a chance to review Medicine for the Soul: The Complete Book of Shamanic Healing by Ross Heaven. This is an introduction to the work of a shaman and also forms the course book for a Certificate in Shamanic Studies awarded by The Four Gates Foundation, the shamanic school founded and run by the author. Publisher Moon Books describes the book as: "A complete study course in classical and cross-cultural shamanism, teaching the reader all s/he ever needs to know about shamanism, shamanic healing, soul retrieval, spirit extraction, house cleansing, cleaning the energy body, working with the souls of the dead – and much more." The introduction promises that if you read the book and follow all the exercises: "...you will learn how to journey in the worlds of the shaman to meet spirit guides and allies, how to retrieve power for yourself and others, how to heal shamanically, retrieve lost soul parts, remove spirit intrusions, rebalance the body’s energy system and gain guidance for the future using divinatory techniques so you can provide counselling to clients from spirit." I would say that it does just that. It is a long book, with chapters on each aspect of shamanic work, including ethical considerations, but very interesting. What I particularly like about it is Ross Heaven's writing style. He is a very good writer, who explains everything clearly and succinctly. The book is also packed with practical exercises so that readers can practice what they are learning as well as get to grips with the theory of shamanic healing. I have to say, I haven't actually tried out the exercises, but I do feel I know a lot more about modern shamanic techniques than I did before, which is exactly what I wanted. Moon Books points out: "Readers have the option of sitting an examination at the end of the book and submitting their answers to the author. If successful (i.e. their standard of achievement is high enough) they will receive a Certificate in Shamanic Studies awarded by The Four Gates Foundation, the shamanic school founded and run by the author." That all seems very practical. Thanks for the information, I too have been interested in this subject. Thank you for sharing.